The name Colonial Heights results from an incident during the American Revolutionary War. In 1781 the French troops of Lafayette, known as the Colonials, set up artillery on the heights overlooking the Appomattox River and Petersburg, where British forces were located. Legend indicates that an English soldier stationed in Petersburg, upon seeing Lafayette’s troops across the river, exclaimed, “Look! There are the Colonials, up on the Heights!” Hence, the name Colonial Heights was born. The area came to be known as Colonial Heights and the name was given to a subdivision of the Oak Hill tract in 1906. The earliest people to inhabit the area were members of the Algonquin Indian tribe, who apparently roamed along the Appomattox River. Several areas in present day Colonial Heights still retain their Indian names. British colonists first settled in the area in 1620, approximately two weeks prior to the settlement of Plymouth, Massachusetts. A small group sailed up the Appomattox River looking for clear land and they finally settled in Conjurer's Field, an area named by the Indians after one of their magicians was thought to have cast spells over the confluences of the waters. Shortly thereafter, Charles Magnor registered the first land patent in the area for 650 acres, which he later developed into a plantation before selling it in 1634. During the period 1677-1685, one of the areas's historic landmarks was constructed with the building of the Brick House, now thought to be the oldest permanent structure in Colonial Heights. One wall of the house survived a disastrous fire in 1879. 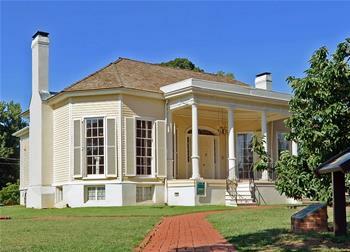 View Old Brick House to learn more about visiting this landmark. The first recorded settlement in Colonial Heights was by Thomas Shore. 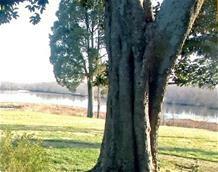 In 1775, he purchased 144 acres of land along the northern bank of the Appomattox River, across from Petersburg. There he built his mansion and called it Violet Bank. Later, in 1864, during the Civil War, the mansion and grounds of Violet Bank became headquarters for General Robert E. Lee. Lee was camped at Violet Bank from June through September of 1864 during the siege of Petersburg. Today, Violet Bank is owned by the City of Colonial Heights and serves as a Civil War museum and is a registered Virginia Historic Landmark. View Violet Bank Museum to learn more about visiting this attraction. The City Seal depicts the figures of the house and cucumber tree at Violet Bank. The flower commonly known as "Magnolia" is the floral emblem of the city.